Having a walk in bathtub installed in your home in St. Paul, Minnesota, is a wise decision if you want to avoid the high step ups involved in entering and exiting a traditional tub. For high-quality tubs that boast a wide range of safety features, turn to U.S. Patio Systems and Home Remodeling. 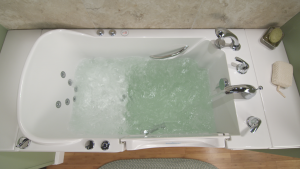 We sell and install the popular bathtubs made by Safe Step Walk-In Tub Co., so you can rest assured your new tub will be safe to use and provide an enjoyable experience. Plus, our tubs include spa-like features like heated seats and water jet therapy, so you can enjoy a relaxing hot-tub-style bath whenever you want. You might even find that these features can help with common symptoms associated with anxiety, stress, back pain, arthritis, sciatica, and other ailments. Additionally, our tubs are manufactured to fit in standard tub spaces, so you can be certain that one of our walk in tubs will fit into your bathroom without much, if any, demolition work required. For more information about the benefits of installing a walk in bathtub in your home in St. Paul, MN, contact U.S. Patio Systems and Home Remodeling today. Our team of specialists are available to answer any questions that you may have.